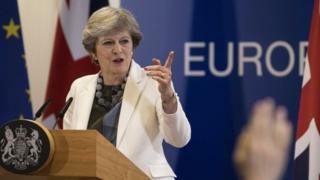 Brexit: Has Theresa May promised EU more money? The UK and the EU have managed together to make a tiptoe forward in the Brexit talks. But listening to EU leaders this afternoon it is abundantly clear that unless they change their minds, the UK is going to have to budge on the cash to make enough progress by December to be able to truly get on to the next phase of talks. Certainly public money is tight in this administration, but frankly a hefty Brexit bill in exchange for a good deal would be the one big payment that the Chancellor Philip Hammond would be happy to sign off. A move on the money is, therefore, primarily a political problem rather than anything to do with the actual funds. A much bigger payment is anathema to many Conservatives, and could frustrate swathes of voters who plumped for Brexit, in part on a promise that the country would get money back. Number 10 is well aware of this. One insider told me "it's all about the quantum," what "the party would swallow'. Could a party with a powerful group of Brexiteers, including ministers who have gone on the record to say we shouldn't be shelling out much, really tolerate the prime minister calling for support to pay tens of billions? This is not a question for now, but it has been logged for future reference inside Number 10. Will there be a day when the prime minister decides to make a plain admission to the country, that the potential cost of leaving with no deal is a scarier prospect than having to cough up as much as 60 billion euros? About half what we spend on the NHS, but more than we spend on defence? Or will she be pushed by those in her party who genuinely believe that is far better to cut our losses and walk out, than commit to an expensive deal. Carrying her party and her European counterparts at the same time is Theresa May's fundamental challenge - on the face of it almost impossible. And today's tiptoe forward is no guarantee that ultimately she will be able to go all the way. PS There's lots of speculation that when the French President said the UK was not even "half way there" he was hinting that the bill could therefore be ultimately at least double 40 billion euros. It wasn't really clear during the press conference that is what he meant, or whether he was using "half way there" to describe the state of the negotiations. However, for ages in Westminster there has been an expectation that the eventual bill will be somewhere in that region, somewhere between 40 and 60, so it is not crazy to imagine that Macron's comments are further evidence that's the case.